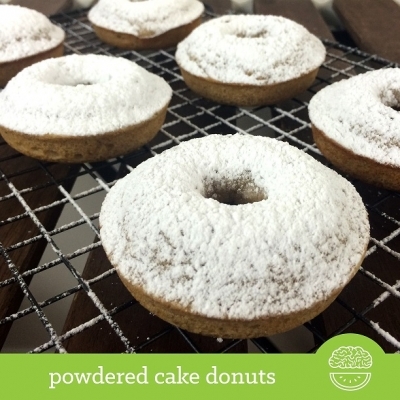 These cake donuts are lightened up with whole grain flours and greek yogurt! Sift a little powdered sugar on top rather than covering the entire thing, and BAKED NOT FRIED for guilt-free enjoyment! Combine dry and wet ingredients separately (except for powdered sugar). Combine dry and wet mixtures together (do not over-mix). Distribute batter into donut pan (I used a piping bag). My distribution yielded 6 very filled donuts, but you could get 8 smaller with less batter in each mold. Bake 8â€“10 minutes, until a toothpick comes out clean. Lightly sift powdered sugar over donut tops as desired.